As we look at the Georgia Tech Catholic Center today, thirty years after the dedication of this Center, it is hard to imagine the change that has taken place since 1928 when the Newman Club was founded at what was then called the Georgia School of Technology. It should be noted that the “Great Depression” began in 1929 so this would have had a negative effect on the new Newman Club. 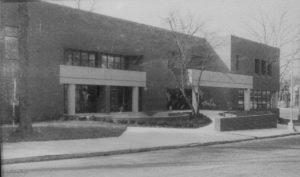 The first listing of the Newman Club in the Georgia Tech “Blueprint” was in 1931. Some later “Blue Print” editions mention that 1931 was the founding date, another one said “1913”. I think we can trust Fr. McNulty that 1928 is the founding date. Lewis F. Gordon was a prominent laymen. He was a Director of C&S Bank. Mr. Gordon is referred to as a “benefactor” for the Georgia Tech Newman Club as well as the founder. Information on the early days of the Newman Club at Georgia Tech comes mainly from two sources: “The Blue Print” yearbook and “The Bulletin of the Catholic Laymen’s Association” which was published 1920 – 1963 when all of Georgia was in the Savannah Diocese. In 1963 this paper was renamed “The Southern Cross”. 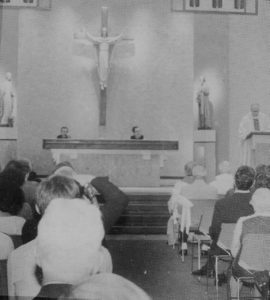 In 1965 Atlanta was established as a Diocese (now an Archdiocese) and its newspaper “The Georgia Bulletin” continues to be published. 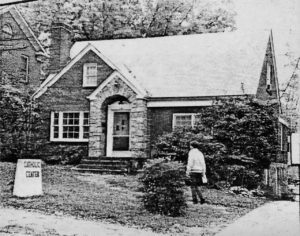 A major event was reported by the “Laymen’s Bulletin” of 12/21/1940: “Georgia Tech Newman Club Acquires a Home”. “The new house was opened for the convention of Newman Clubs of the Southeast Province which was held November 22-24 under the sponsorship of the club at Georgia Tech. The building was formerly the Phi Delta fraternity house, located at 87 North Avenue. Many new members joined the Georgia Tech Newman Club this year, including several associate members from Agnes Scott in Decatur.” This location was the section of North Avenue that is now the Downtown Connector Expressway. From information in several “Blue Print” annuals from later in the 1940’s, this house was referred to “our former house”. No details were given for why or how the house was given up. However, that was the period during World War II. In 1952, the Newman House was established at 158 Fourth Street. In 1963, an adjoining lot at 154 Fourth Street. was purchased. Roland Toups, who was a member of the Newman Club in the late 1950’s, mentioned that Sunday Mass was held at the YMCA on North Avenue. 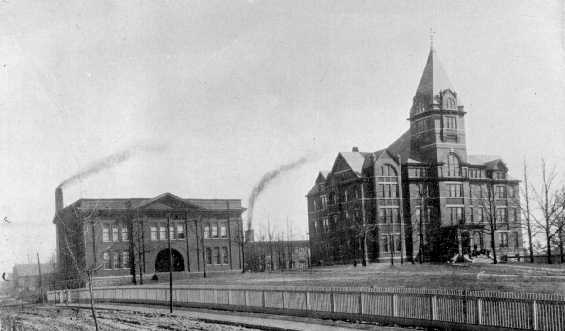 That building is now home to the GT Alumni Association. In 1970, Fr. Mario DiLella, O.F.M. was assigned as Chaplain and would be the chaplain for many years until his retirement in 2008. The property on Fifth Street was later purchased by the Archdiocese. 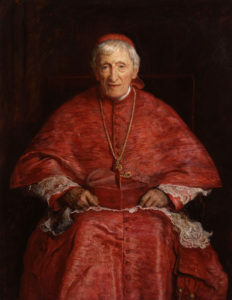 In 1982, Fr. Mario expressed to the Archbishop the need to expand Fifth Street or build a new home for the Catholic Center. The plan was approved by the Archdiocese and $944,000 was budgeted. The Archdiocese swapped the property on Fifth Street with Georgia Tech for the current property on Fourth Street. There were 1,850-2,000 Catholic students at Georgia Tech at that time. Marilyn Somers, Georgia Tech Living History Dept.